Go ahead, punks. Mech my day. Update (11 May): Added in more tips on building & loading out mechs. We had a taste of the new Battletech PC strategy game recently, and it is glorious! It looks great, and it plays like a dream if you’re into managing a mercenary group of four Battlemech pilots trying to scrounge up cash doing the odd mercenary job or two while helping a royal faction gain prominence. Yep, micromanaging a group while also dealing with repairs and employment hazards can be tough in the world of Battletech. Let us lend you a hand with these quick tips for survival. Knowing about your Battlemech’s hit points isn’t enough – that’s represented by the orange squares. You need to keep track of a mech’s armour points (white squares), heat levels (red bar), and stability level (yellow bar). The golden rule here is: structural damage is very bad and is expensive to repair/replace. Attacking all of them is an exercise in futility, so you need to have Battlemechs who are specialized in taking down an aspect of an enemy mech as quickly as possible. At the same time, you need to be wary of the heat levels and stability of your mech. Continuous firing of your weapon (among other factors) overheat your mech; if the red bar is at max, your mech shuts down and is prone to attacks. You will also need to keep your mech’s stability in check; focused fire on a mech’s legs and melee attacks can affect a mech’s stability. If you perform death-from-above moves, your mech’s stability gets affected too. When a mech topples, it’s also prone to attacks and precision shots. So don’t fall down. Just like any other strategy RPG, stats and buffs matter in the long run. For example, your mech will get Evasion stacks if it’s on the move every single turn. This means that it’s harder to hit with ranged weapons, and you’ll need tools like Sensor Lock or plain old melee attacks to circumvent it. But here’s the kicker: even when you miss a shot, you still shave off a stack of a mech’s Evasion buff. This means that you can use lighter faster mechs to deal with mechs with huge evasion buffs, and then set them up for a heavier blast from another heavy mech you own. When your mech braces, it gains the Guarded and Entrenched buff. Guarded halves incoming damage from the front and sides while Entrenched reduces stability damage. To deal with the former, use melee attacks. To deal with the latter, don’t go for the legs and just deal with other parts of an enemy mech. Much like Xenoblade Chronicles 2, salvaging means bonuses galore. Unlike that awesome JRPG though, you use these to build Battlemechs. After every battle, you get to divvy up your rewards with either cash, salvaging rights, or faction reputation. While having money is good, salvaging is also useful because you can acquire gear like lasers and jumpjet for free, or even get three pieces of a particular type to net yourself a brand new mech in your merc roster. Finishing the set means that you get access to the mech with its basic loadout. This means that strategies like sniping pilots off of mechs for better salvaging opportunities are viable. 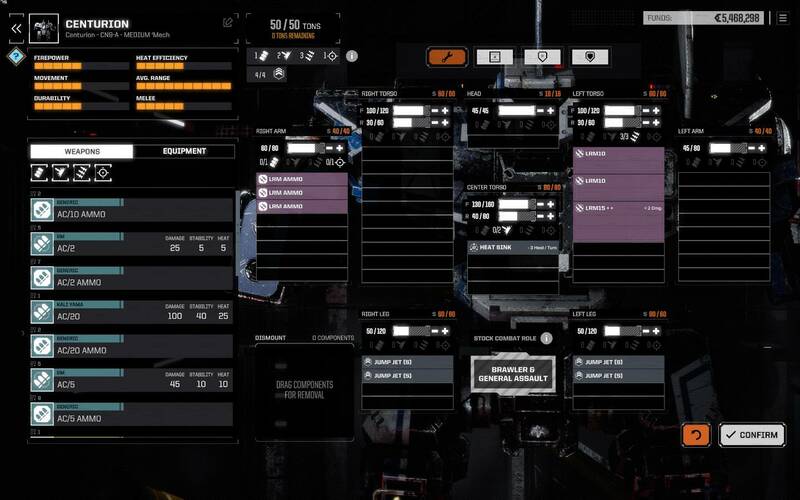 Pilots in Battletech earn XP which can be invested in four paths: Gunnery, Piloting, Guts, and Tactics. While you can max out all four paths, you can only acquire the first special abilities from two trees and the second special ability from one. The latter selection determines your pilot’s final class. For those starting out right now, we suggest you start out with either Piloting or Guts, then pair either one with one other path. Go for something like Piloting and Tactics – which allows a pilot to master using fast mechs and apply Sensor Locks on important targets. Or Guts and Tactics, which allows you to be a happy camper on a hill, firing long-range artillery while hidden and Guarded/Entrenched. If you’re feeling ballsy, go for Piloting and Guts: this is perfect for melee-focused pilots. Opting to Reserve means that you can act and wait for your opponent Battlemechs to move first while also preserving your initiative (ie your turn order screen). Even though taking the first turn can give you an advantage, this also means that the AI will react to your strategies. It’s best to just react to how your opponent moves in the long run. So use that Reserve option whenever you can so that you can have your Light and Medium Battlemechs react. The AI in this game can be merciless; they will concentrate fire on the weakest Battlemech you own or the most wounded. Yes, this is a route your team will take, but you only have four Battlemechs at your disposal. Your opponent has more than that, plus static defences and so forth. Just be mindful of the AI when it pulls off concentrated fire stunts on your weakest link. Pay attention to the line of sight and scanner range on the map. General rule: if you can scan your opponent, the opponent can do the same. Kill scouts and spotters while breaking their line of sight when you can. If somehow their spotters see three of your Battlemechs all at full health, the AI will mostly divvy up its forces. Mostly. 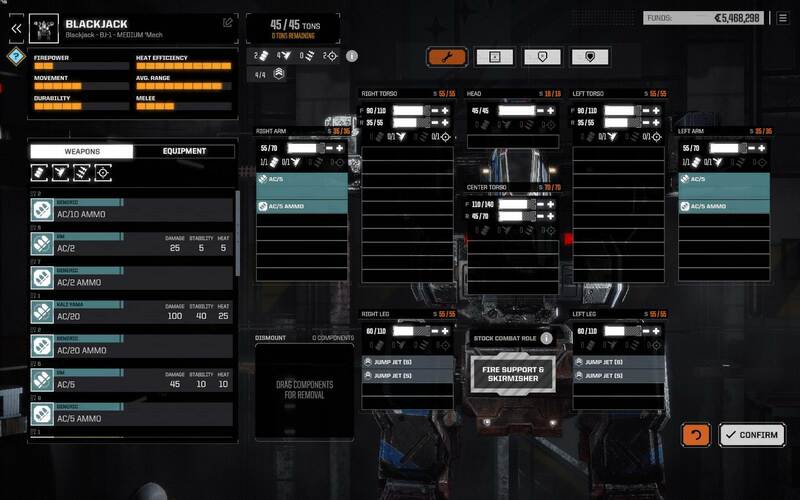 Battletech’s AI can be a bit spotty, but at least it is consistent with its focus fire tactics. …by your Inspiration abilities. Basically, you can use these abilities if you have enough morale points built up by just fighting and doing well. You get to use either Precision Shot and Vigilance – these are useful if you feel like the odds are against you. Precision Shot lets you take a called shot against an opponent who hasnt’ been knocked down. Not only can you pick off opponent Battlemech legs and weapons, you also knock them back a slot in the initiative order. This means that you can push back a heavy mech back to the initiative order while your light/medium Battlemechs dish out the pain further and further without much repercussion. Vigilance gives a Battlemech the Guarded and Entrenched buff regardless of what they’re doing while also putting them ahead in the initiative order. It also removes stability damage so this Inspiration ability can grant your Battlemech team a huge comeback factor. This can be incredibly life-saving if your mech platoon is full of Heavy mechs and they’re on the brink of falling down: saving up your morale points for this ability can turn a dire situation atop its head. No joke about it: mech orientation matters. If your mech’s left armour is all gone, orientate your mech so that its right side is facing the opposition. As we said before, true damage is a pain to repair compared to armour repair. After repositioning yourself, take a brace action. You may not be counter-attacking, but at least you’re buying yourself time before your Battlemech partners pick up the firing and shooting slack. The thing you need to know is that every Mech comes standard with 10 heat sinks built into its engine. That means it’ll dissipate 30 heat a turn by default. Thus, what you should try for is to use one hot weapon that can take advantage of this dissipation, and then a cool weapon to balance it out. 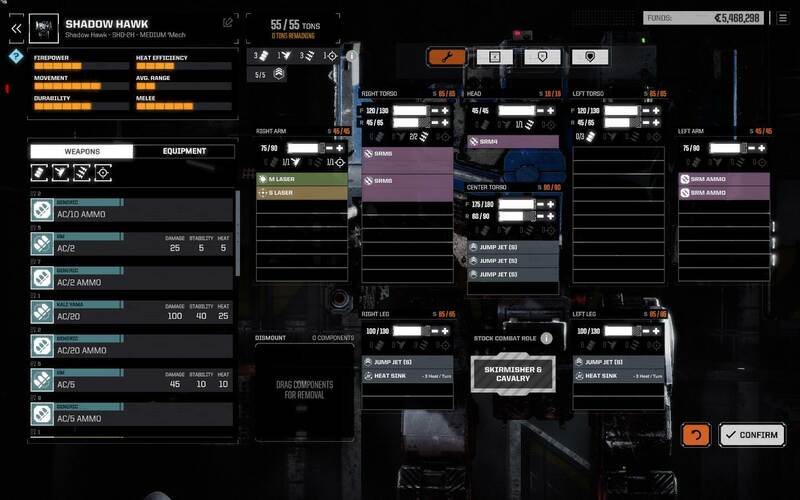 For example, a loadout with a PPC and an AC5, or a PPC and a large LRM. Or an AC5 and lots of MLs. This will give you much better results than simply using all your tonnage to mount all ACs, or all PPCs. Bulwark/Sensor lock mechs with SRMs in front. They can Sensor Lock, can tank, and can provide LOS up front. Multi-target and Bulwark LRM mechs behind. Basically, you want builds that can take a lot of missiles. Examples include Centurion, Catapult, and Orion. Missiles are strong at the start and just get stronger later on. Go full-on with SRM6 and M Lasers. Add a full complement of Jump Jets. Add Heat Sinks to balance out the heat generation. Specialization has been working for me. 2 brawlers, one ballistic sniper, one artillery SPG. My early squad was two Shadowhawks, one Blackjack, and one Centurion. Used a Vindicator before I got the second Shadowhawk, Enforcer is also a nice holdover for Dekker. Brawlers occupy the front line, tank hits and provide sensor locks. Don’t need to concern yourself with heat much on these ones as SHD use melee as often as weapons, and melee doesn’t generate heat, but it’s nice to be able to alpha twice in a row. The ballistic sniper is simple: cannons and ammo, stay back and shoot stuff. Same goes for the artillery, but those don’t even have to have direct line o sight. These don’t need much armour and you’re limited only by hardpoints, but on vacuum and desert maps the artillery will eventually have to shut down one and later two of its LRMs if firing continuously. But by this time you’re mopping up the last mech and it wouldn’t make any difference. Generally, look for hardpoints and when you get a new mech, play around in the refit screen to see if it fits anything good. You’ll get the hang of it eventually. One thing to point out is that my sniper and artillery are specced in bulwark, so if I’m getting overrun with ‘reinforcements’, the SHD’s can fall back and have the backline tank some hits while they’re flanking, surrounding the enemy lance. That’s why there’s so much armour in place of a few more heatsinks on the artillery, for example. Another is that this build has a lot of stability damage – every single mech deals it. Knocking down mechs and using Precision Strike is very powerful, as you get to control the initiative scale. Usually, if an enemy mech gets knocked down, it doesn’t get up again, unless it’s a barely-armed light mech in a lance of strong mediums.